Halloween is a time where little ghosts and princesses ring your doorbell, making your dogs go crazy, while the kids go into a sugar coma by the end of the night. But we forget about their super cute companions that walk the streets with them at night. 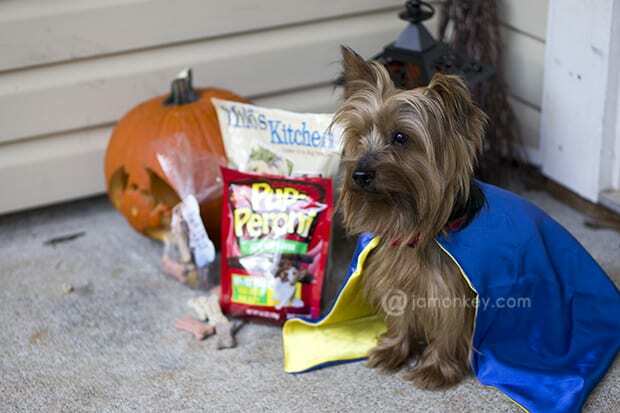 Dogs like to go trick or treating just as much as kids do but they don’t get the benefits of a yummy treat. Until now that is, it’s time to “Treat to Pups”. My dogs literally flip when they hear the treat bag open. Our favorite is the Milo’s Kitchen Chicken Grillers because they are 100% real meat and have no artificial colors or flavors. Plus, they are soft so my older dogs don’t have any trouble with them. Pup-Peroni Beef Sticks and the classic Milk Bone is also a great treat choice. 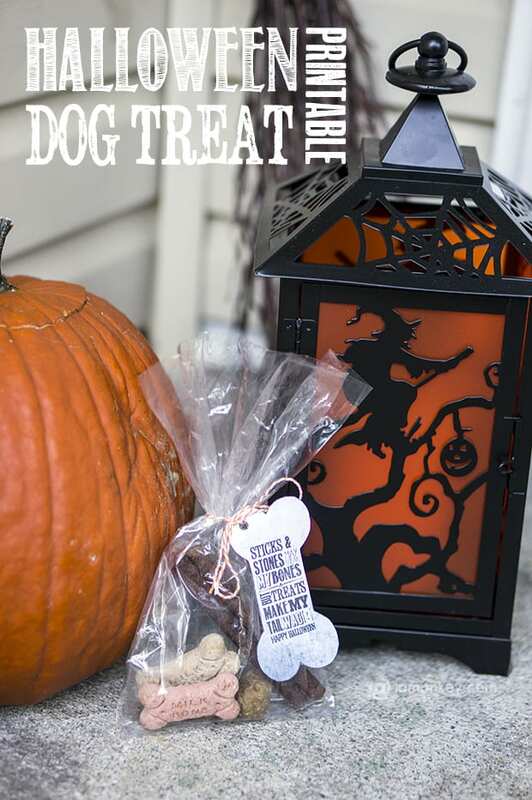 Giving dogs a special treat bag on Halloween not only shows the owner that you care about them as a neighbor but also that their dog is an important part of their family. So this Halloween we are going to share the treat love by handing out doggie treat bags. Snag your treats from Walmart. 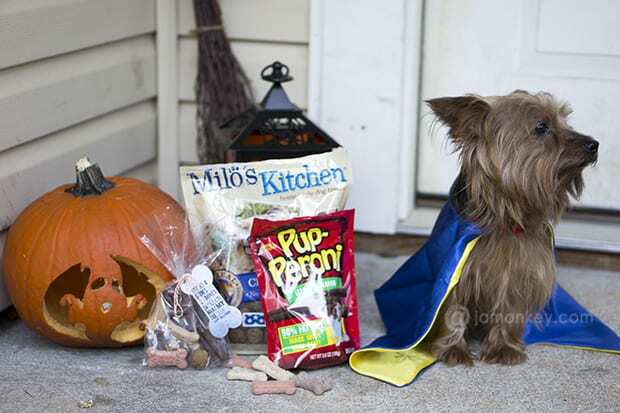 Need some tips on trick or treat with your dogs, here are a few to remember? You never want to feed chocolate to a dog; it’s very bad for them. Also, make sure that you have a leash on your dog. Even if they normally walk with you without one, it’s a busy night with yelling children and scares around every corner. Some dogs may panic or get over excited. For our special doggie Halloween treat bags I made a special tag to go on them so that the owner knew that they were for the dog and not the kids. 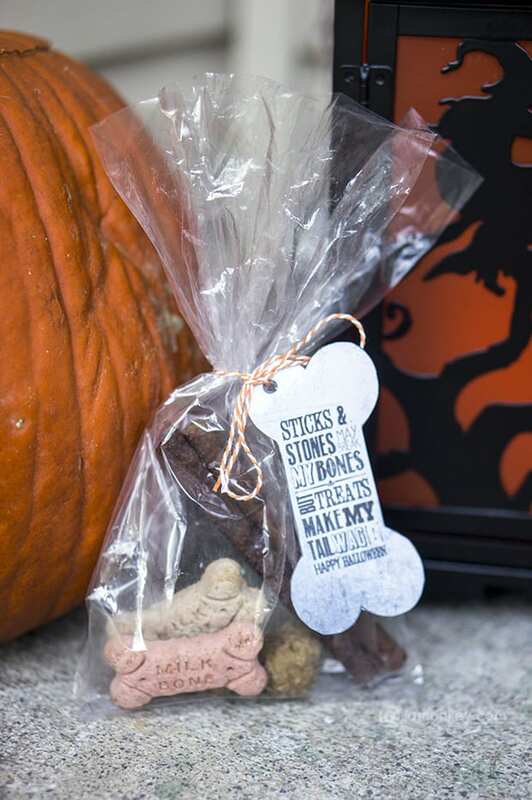 It says ‘Sticks & stones may break my bones, but treats make my tail wag! Happy Halloween’ I included the Pup-Peroni Beef flavored sticks, Milk-Bones and some Milo’s Kitchen meatballs to look like stones. I placed them in a simple clear bag and tied them with thread and attached the tag for it. It’s a simple DIY project to cheer up any dog that comes to your door. You can download this free printable for the Halloween Dog Treat Tags here. Your dog…in a cape! Adorable!!!! Awesome! These are too cute. Might I also say that the dog in costume is simply adorable! I’m sure there will be lots of doggies happy not to be left out!